Viscose Bamboo has a very soft lustrous look and feel much like tencel and silk. At a fraction of the price you can enjoy a cellulose fiber that has similar properties to that of silk. Viscose bamboo is processed differently than Bast bamboo. The production process is similar to paper production. The bamboo is ground into a pulp and then extruded through a spinneret. The spinneret forms the pulp into long strands which harden into the fibers. We have definitely given you the simplified version here. This fiber takes dye brilliantly, has a staple length 2-4 inches and a micron count of 19. 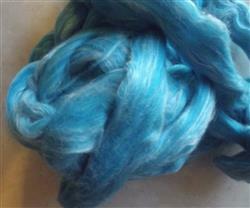 Suitable for spinning and knitting into garments or accessories or woven into fabrics and textiles. This bamboo is incredible! It's our first time spinning with it, and we can only say ' wow'! It's silky, so lovely to touch, and absolutely beautiful. It was wonderful to work with. I hope that it is readily available. I used end with other fiber.